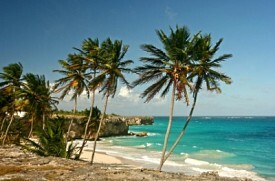 With its natural caverns and flower forests, Barbados lends itself well to roamers. City tours of bustling Bridgetown are popular, as are island tours that show off the estates and plantation homes of the countryside. Other options include a rum party cruise or submarine ride. The Bridgetown Port is located approximately a half hour from the Grantely Adams International Airport. Take the ABC Highway from the airport towards the west. The first traffic light on the highway will be Sargents. Stay in the left lane and continue straight through the traffic light. You will now be leaving the ABC Highway. (if you turn right you will continue along the ABC Highway) Continue straight, you will reach a round-about at Collymore Rock. Keep going straight until you reach another round-about where you will also keep straight until reaching the traffic lights on River Road in Bridgetown. Turn right at the light and cross over the bridge keeping in the left lane. Turn left immediately after crossing the bridge, as the road becomes one way. Continue along by the boardwalk until the road forces you to turn right and then left almost immediately. You are now on the "Princess Alice Highway" which will lead you directly into the Bridgetown Port.